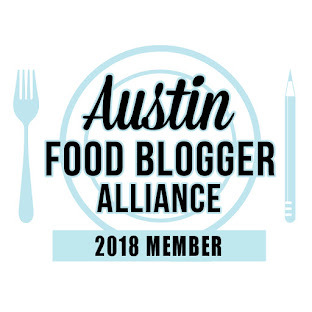 If you keep up with me, you may know that one of my favorite trailers around is The Flying Carpet, with their Moroccan kefta and amazing l'afrique sauce. Not only are they located close to my house, but it is run by some dedicated people, Abdu and Maria. 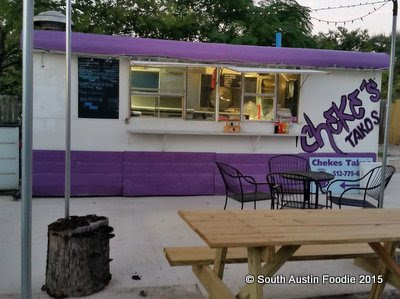 They share space in their lot with two other trailers at 504 W. Oltorf, and Maria has been telling me for awhile "You gotta try Cheke's Takos." Well I finally made a trip specifically for Cheke's and Maria was SO right! The Popeye's on the corner at South First and Oltorf is no longer operational, and the Church's chicken is the building to the east. Then there's a bright blue house and a driveway between it and the hair salon next door. If you take this driveway, it goes to a back lot where the TFC, Cheke's, and Pie Plante trailers are located. The blue house is generally open for customers to sit inside and eat, or you can enjoy your food al fresco. 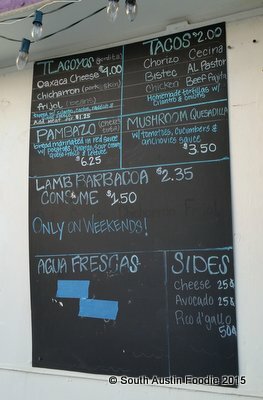 Here's a look at Cheke's and their menu. I started with a tlacoyo, an oval-shaped piece of comal-toasted masa with toppings, not unlike a gordita or huarache. 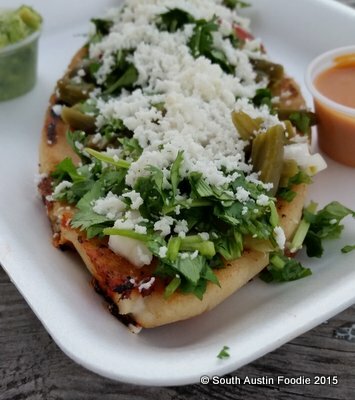 This is the plain cheese tlacoyo, with nice fresh cilantro and onion. I thought the dough could have used a touch more salt, but according to Wikipedia, they are traditionally made without salt or lard. Good texture, not too chewy, and everything was very fresh. Per Maria's recommendation, I had the pambazo, which is Cheke's version of a torta. 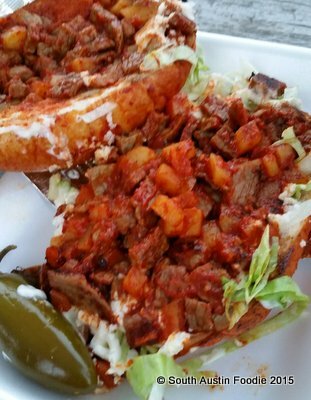 The bread is dipped in red chile sauce, griddled a bit and stuffed with a mixture of chorizo and potatoes, topped with sour cream, queso fresca, and lettuce. Maria said to get it with the beef if they had it available and they did. This was so savory and delicious! The red sauce had just a bit of a chile kick to it, enough to make my nose run a teeny bit. And beef and potatoes are pretty much always a great combo. While this is presented as a sandwich, it was a fork and knife experience for me. I would most definitely eat this again with the beef, but I do love some good chorizo, so I might have to try the original version next time. And there will be a next time. I've been thinking of the pambazo just about daily since I had it. Cheke's is clearly making some strong Mexican street food, and while I am not an expert, I can tell you nothing was greasy and everything was made fresh. The owner does update their Facebook page regularly, but I would also encourage them to add MORE pictures of the food and especially the daily specials, as I think the visuals would really help to draw people in. They had lamb tacos on Saturday... I don't think I've ever had lamb in a taco! Yes, please! 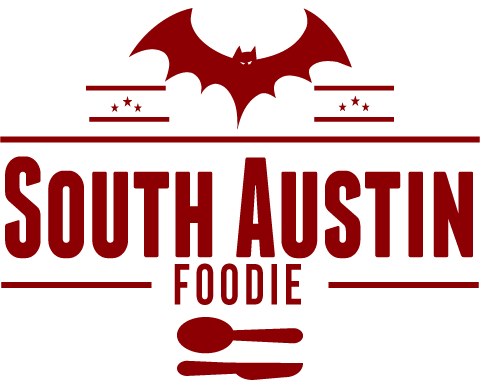 With the weather finally starting to cool down at night, it's getting to be perfect opportunity to eat trailer food! Do yourself a favor, bypass your traditional Mexican food brick and mortar establishment, grab your favorite adult beverage, and go enjoy the simple and simply delicious food that is Cheke's. I don't think you'll be disappointed. But leave room for Pie Plante for dessert (three flavors available daily, check their social media to find out which ones; coconut cream is my favorite!) or try some of the Flying Carpet's Moroccan kisses: dates stuffed with almond butter, tahini and sprinkled with a touch of sea salt. There's A LOT of good stuff happening at 504 W. Oltorf, I am telling you.